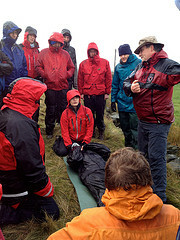 A few years back (about 4 I guess) I went on the Woodhead Mountain Rescue Team's (North Peak) first aid course. I raved about it so much that many of our club went on one soon after. First Aid tickets last 3 years so there was quite some interest in another course (and frankly you forget so much of it it's well worth it). Two days staying at their MRT base (bit like a hut with z-beds) starting on Fri night and lasting till Sunday evening at 100 quid a piece it ain't cheap as chips but represents fantastic value for money (and compares very favourably with competitors) as it a good larf to boot. Woodhead don't run many of these courses anymore as it's very time consuming but Nigel nagged them so much they gave in. So it was a team of 14 (see below for name check) that drove the 60 or so miles to Penistone (stop that sniggering!). 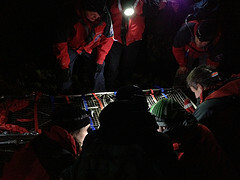 A mix of classroom teaching with chat and debate and real live scenarios in the rain led up to the highlight which is a staged event – we are bussed out in the dark and wander along the hillside to come across 10 bodies lying about on the ground, and have to sort it. Most of us were nervous with anticipation. Some things went really well, other people (yours truly) had a mare – but experiential learning doesn't get much tougher than this. We then got fed a great meal before many headed for the pub. Sunday brought another set of classes, our own presentations and another scenario and quick test, and we were done by 5. Knackered but happy we all passed. A great course well taught in a fantastic venue with good experienced super qualified people and good humour, made the whole weekend a success and the more first aiders the club has the better in my view. Big thanks to Caralyn for organising, Wayne for delivery and Jez for support. Also the the whole of the Woodhead team for 'bodying', examining, feeding us and being good company. Cheers Guys. You are currently browsing the York Alpine Club Blog blog archives for December, 2011.